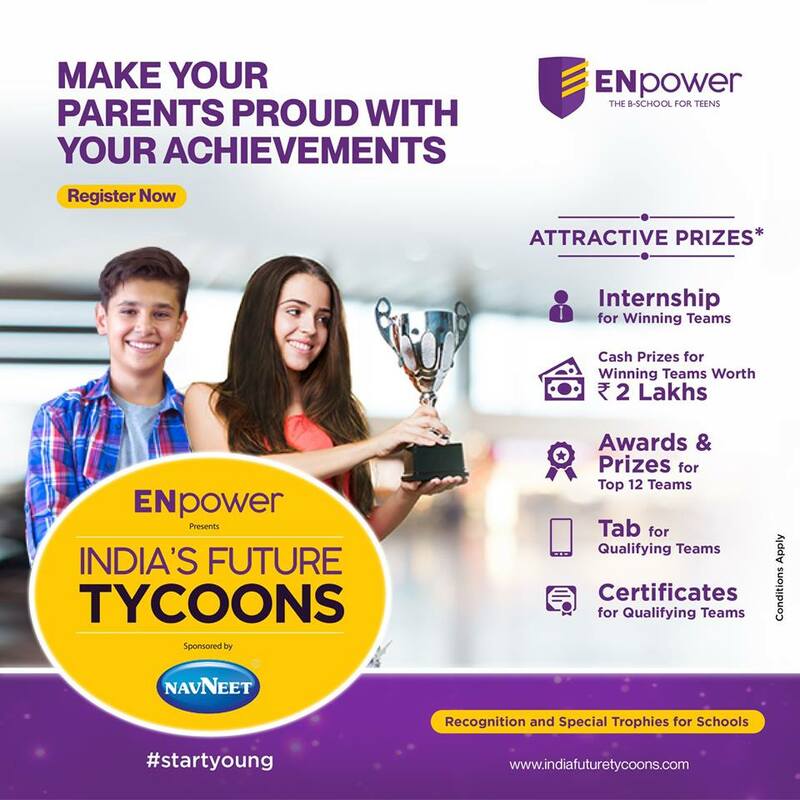 ENpower presents the first ever business and entrepreneurship platform for early teens (13-17 years of age) - India’s future Tycoons, a competition for students. This is a platform for young teens to explore the exciting world of entrepreneurship and showcase their ideas about ventures. The platform has been designed to attract great minds to present their ideas, improvising on it, being trained by experts and making it an actual business model. To participate, you require a team of 2 or 3 members and pass through 4 levels of evaluation. Top 100 teams will get a chance to attend a rigorous boot camp with startup experts, qualifying teams will receive certificates and tab and top 12 teams will receive attractive prizes in the Grand Finale that involves cash prize worth Rs 2 lakhs and internship opportunity for winning teams. As per research, early teens (11-18 years of age) are at their formative stage of their life building their own beliefs, habits & independent thinking. At this stage, it is necessary to let their minds explore numerous opportunities instead of asking them to confine their ideas. ENpower believes that exposing them to entrepreneurial life skills (problem solving, decision making, creativity, collaborative working, leadership, critical thinking, resource management, communication, risk taking, managing failures) and entrepreneurship life cycle (ideation, opportunity evaluation, building solutions, venture creation) would help them to explore themselves better, encourage out of box thinking, build ability to look at ‘problems’ around them as ‘opportunities’ and pursue ideas in the area of their own ‘passion’. India’s Future Tycoons competition is a merger of fun, learning, challenge and recognition that allows teens to pitch their ideas to industry veterans and showcase their entrepreneurial talent. It provides teens the liberty to pursue their entrepreneurial mindset and chase their dreams even before they enter the real competitive business world.